The very first thing I learned to make without a recipe was chocolate chip cookies. My sister is very particular about what she eats and chocolate chip cookies are one of the things she will always love. Whenever I would babysit, I would usually end up making cookies for us. The best part is when I went to make these, it was still all in my head. Butter, sugars…vanilla, egg…flour, baking soda, salt…I don’t think I will ever forget. We almost always made a halved recipe, since it was just the two of us. That’s what happened this time around as well. 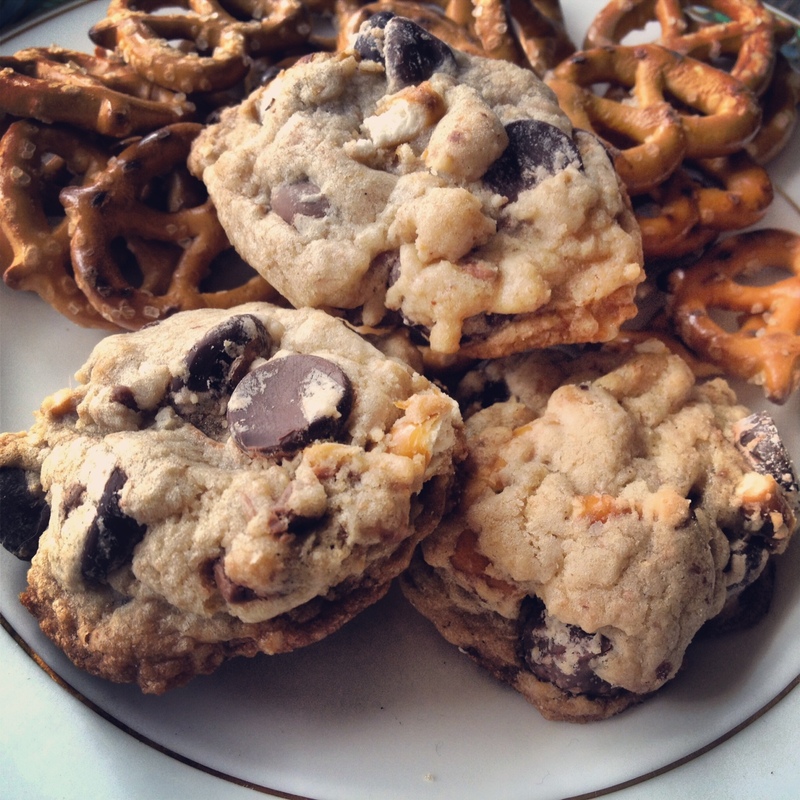 Except this time, my picky sister wasn’t around and i had some other ingredients…Pretzels and Toffee. 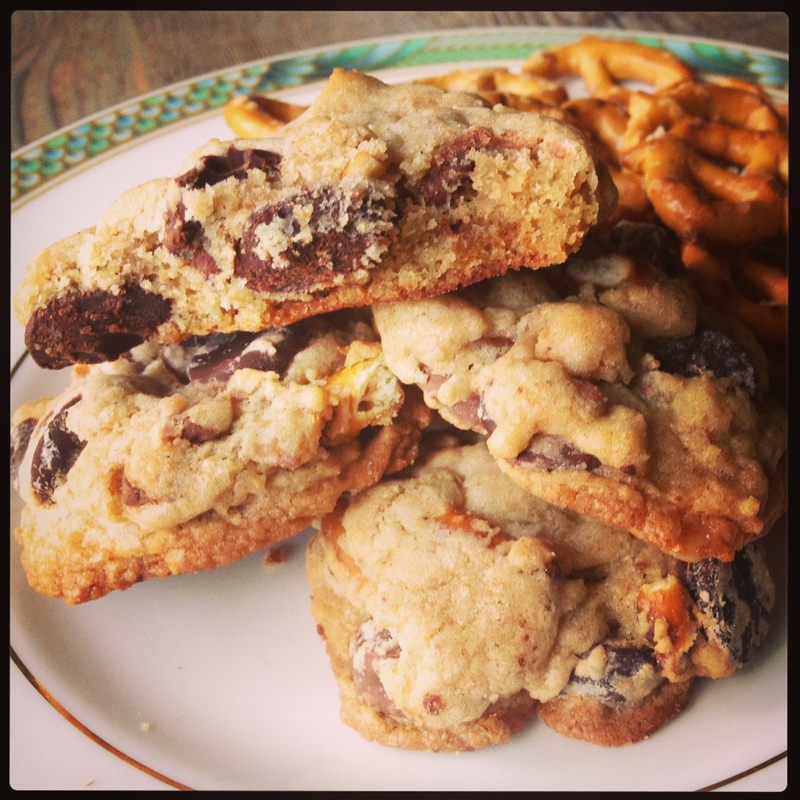 The combination is everything you want in a cookie…sweet and a tad salty, with and nice crunch from the pretzel that is nowhere near that of a burnt cookie. I ended up giving these to my bestie (and bridesmaid!) Morgan, who had just gotten out of a gnarly surgery. I don’t know if they helped ease the pain, but I would like to think they did! 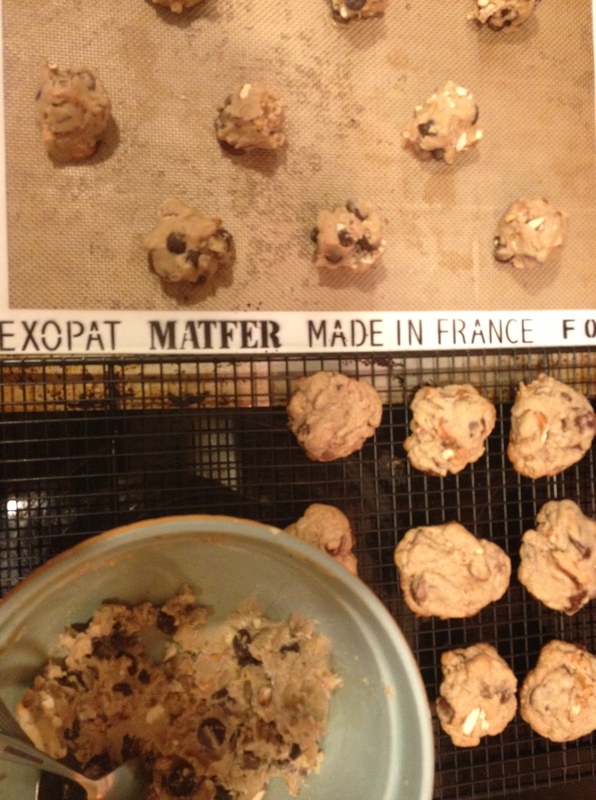 makes about 2.5 – 3 dozen cookies, depending on how big you make them. Preheat the oven to 350F. Line baking sheets with parchment paper or grease cookie sheets. In a medium bowl, sift together the flour, baking soda, and salt. Set aside. (I am usually too lazy to actually do this step). In a larger bowl, beat the butter and sugars together on medium speed until light and fluffy (about 2-3 minutes). On low speed, add the egg and vanilla extract. Beat to combine, scrape down the sides of the bowl. Add the flour mixture and beat just until there are no more streaks of flour. 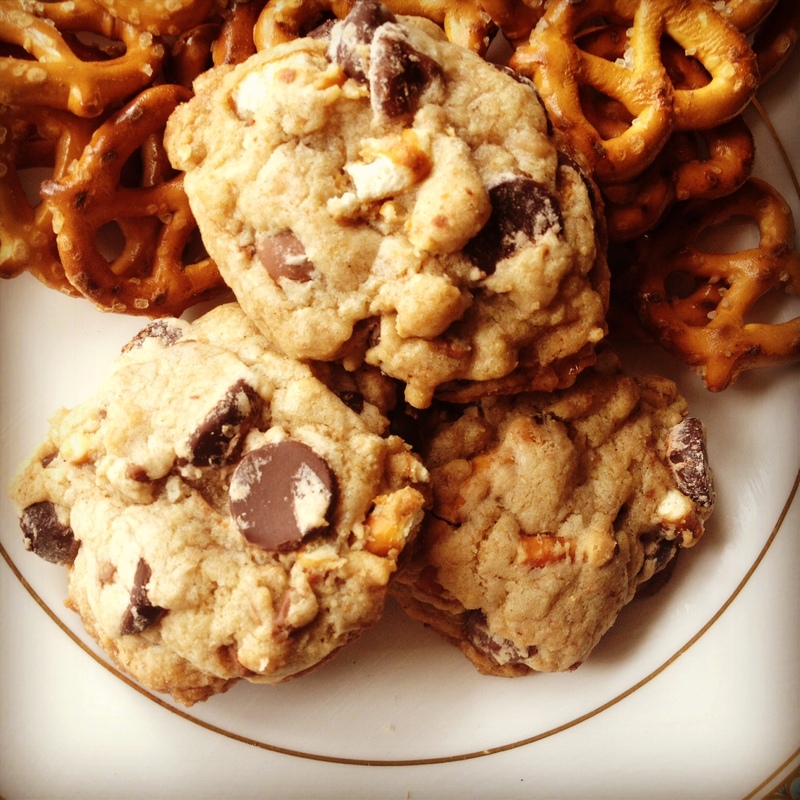 Stir in the chocolate chips, toffee bits, and preztels. Cover and refrigerate for at least an hour. 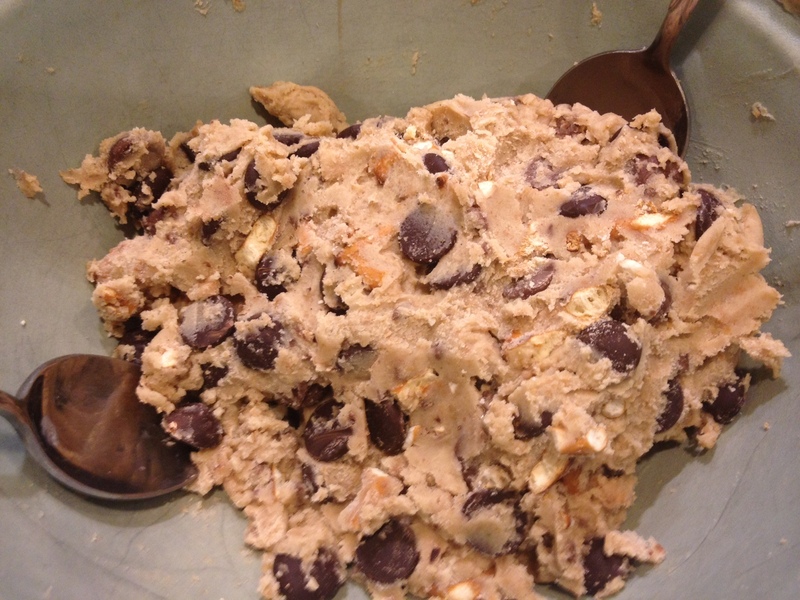 Scoop out well rounded tablespoonfuls of cookie dough and add to cookie sheet. Leave about 2 inches between each ball. Bake for 10 – 12 minutes or until desired cookie crispness. Allow the cookies to cool on the baking sheet for a few minutes before removing. Loved these cookies! Love you! I made it into your blog!